Full rate-production is slated to begin in 2019 and the U.S. Air Force wants to buy 60 planes in 2020, and 80 F-35 per year after that. This year, the Air Force is to receive 28 F-35s, whereas in 2016 the number is slated to increase to 44. 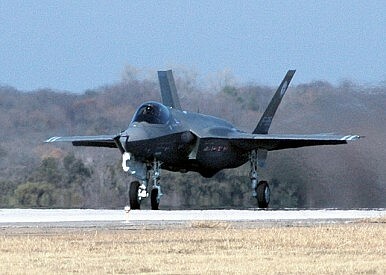 By 2038, the service wants to have 1763 F-35 aircraft in service. However, this procurement schedule might not be financially feasible for the Air Force. The service is looking at a three-tier force, with 300 F-16s and some F-15s being modernized “to augment the F-35 and F-22 in a high-end fight” and others assigned to low-end operations, while the contemplated 72-aircraft buy (an Air Force wing) would sustain force numbers and provide additional modern aircraft. Interestingly, a senior U.S. Air Force official revealed that “the last time we looked, this was more expensive than buying F-35s in bulk.” However, he confirmed that the option of purchasing 72 aircraft is nevertheless still on the table. The U.S. Air Force has already asked for cost estimates on procuring new F-15s and life-extension/upgrade options. “Also under consideration is a plan to augment U.S. Air Force electronic attack capabilities by fitting some F-15Es with a version of the Raytheon Next Generation Jammer pod,” the article states. Overall, the Pentagon is planning to procure 2,457 aircraft by 2038. Total acquisition costs are estimated at over $400 billion making it the U.S. military’s most expensive acquisition program. Operation and support costs throughout the aircraft’s lifetime are estimated at over a $1 trillion. The supersonic fifth-generation F-35 Joint Strike Fighter exists in three variants: The F-35A conventional takeoff and landing variant for the U.S. Air Force; the F-35B short takeoff and vertical landing variant for the U.S. Marine Corps, and the F-35C carrier-suitable variant for the U.S. Navy.